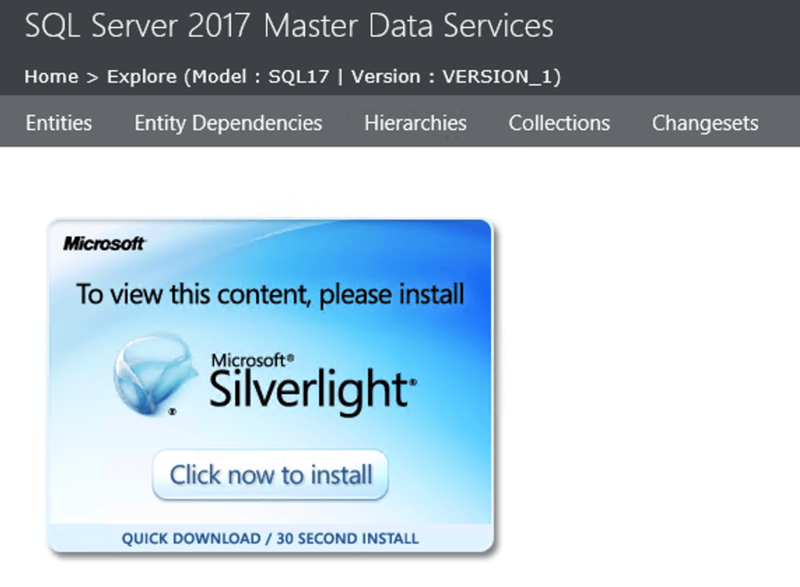 I have a very special relationship with MDS (Master Data Services), and even though for some reason I have never blogged about it, I feel like SQL Server 2019 is bringing a good reason to blog about. Before we continue, let me ask you one question, have you heard about Silverlight? Or in other words, and with a kind of evil voice “DID YOU EVER INSTALLED SILVERLIGHT ON A PRODUCTION SERVER”?. Because in order to make things work in MDS correctly, one needs this old, for a very long time deprecated framework, that is supported only in deprecated browser that is called Internet Explorer v.11, and that pain-in-the-neck framework is called Silverlight and if you dare to work with any SQL Server versions before SQL Server 2019, the picture on the left will appear in front of you at the moment you will try to explore the master data in the MDS Explorer – ensuring that unless you install a totally abandoned (and obviously unnecessary product, that represents another risk on your server) is a necessary thing. That is alone is the reason for some people would use some development VM in order to work with MDS, but that is not a good excuse to include that product in SQL Server 2016 or in SQL Server 2017. 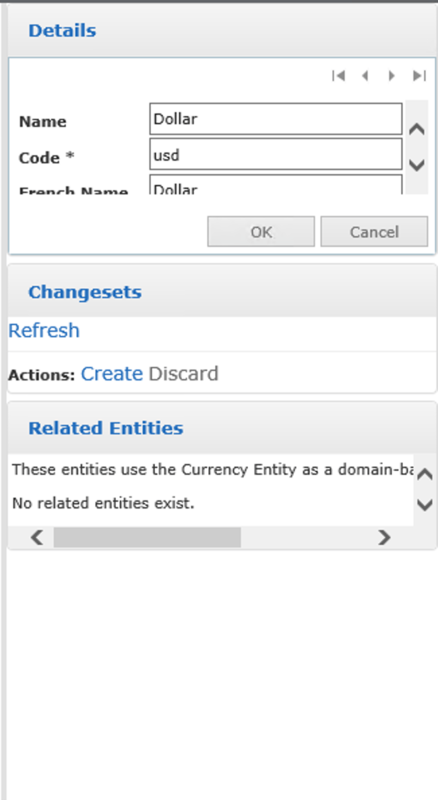 As you can see on the picture above, this is pretty much a functional HTML interface for working with Entities, Entity Dependencies, Hierarchies, Collections and Changesets! This is a major step forward and I am so glad to be alive during this moment, because quite honest I tended to believe that this would take a good 10 years and a death of a product to change. Giving us now a choice of using any other browser besides the Internet Explorer 11 and allowing to work from different platforms or formats (even though not now, but hopefully in the future). For what it is worth, i have successfully tested a good number of functionalities in Firefox. No more Silverlight – Yahoo! Do not think that by the initial public CTP 2.0 the interface would be bugless (and do not get me started on the bugs with silverlight, they were reported to the team enough times), but it is a start and if you are into the MDS – you should definitely try it out and deliver the feedback to the SQL Server development team, so we all can get a better product by the RTM. On the picture on the left you can see a full screen (!) of my notebook which is very from being friendly or editable for that part – and just think what would happened if there would be more than just 1 additional attribute assigned to the entity … Or if there would be a hundred … Yeah, I know – that is why we all love Excel (unless you are on Linux or Mac or using a tablet). I do not like the look and feel of the implemented buttons – instead of going for a good modern look, a decision of Silverlight emulation was probably taken – making sure that the interface will keep on presenting itself as some old software from the last century. The lack of the horizontal scrollbars for the Master Data Management is still as irritating as it was many years ago. In the basic tests of the Integration Management I was happy with what I saw, especially given that this is a pretty early release. Do not take this feedback as a negative one, I am critical because I really would love this product to grow and to succeed, because right now anyone who is truly serious about Master Data Management is looking towards other vendors, such as Profisee. Is this a promise of a brighter future for the Business Intelligence people working with Data on the Enterprise? I do not think so, but I think it is a very first step on ensuring that not everything is lost. I wish that the elimination of the Silverlight is not some kind of Windows Server requirement and that we soon can see a presence of the Linux version of the MDs (on the Apache, for example) and eventually (or even before) a PaaS (Platform As A Service). I will be looking and testing the new MDS, with no public blog posts anticipated – but I will be closely watching where the MDS team will be taking the product forward. Thanks, Niko! I was wondering when Microsoft would get around to addressing the Silverlight issue! Good to know! Agree heartily on the PAAS option! The company I work for (Profisee) was a big contributor to MDS and we currently know it. Many of the original MDS developers actually work here now, and are putting everything they wish they included in the original product in the Profisee platform. Your company has a vastly better platform for MDM, no doubts about that – the problem was/is the licensing, that would prevent any middle tier company for its usage – in my opinion. From the other side, the hidden costs of the Data Quality might make it well worth it, but hey – I am not a manager or director in the charge of the decision.